Intussusception occurs when bowel slides into adjacent bowel; also described as ‘telescoping’ . The most common radiological management in the UK is reduction via fluoroscopically guided air-enema . Previously, the success rates for this were calculated using the Selected Success Rate (SSR), based on the number of successful reductions as a percentage of all attempted reductions [3,4,5,6]. Recent literature and proposed British Society of Paediatric Radiology (BSPR) guidelines suggest a more representative marker is the Composite Reduction Rate (CoRR), based on the number of successful reductions as a percentage of the number of reductions that should be possible using air-enema, i.e. excluding those with a lead point/precluding pathology [3,7]. 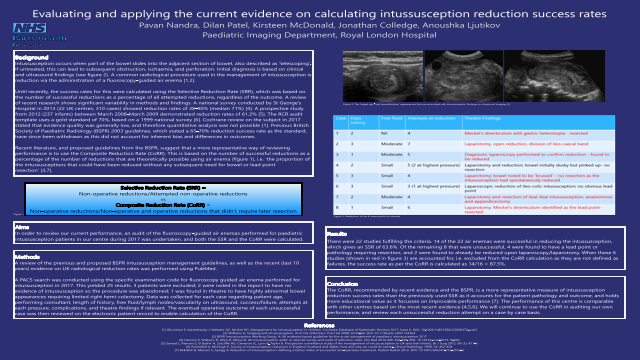 To review the air-enemas performed for intussusception patients in our centre during 2017, and calculate the SSR and CoRR. PACS search was performed using the relevant examination code, yielding 22 results (after exclusions) in 2017. Data was collected for each case and the operative outcome of each unsuccessful case was reviewed on the electronic patient record. 14 of the 22 air-enemas were successful (SSR=63.6%). Of the 8 unsuccessful cases, 4 were found to have a lead point/pathology requiring resection, and 2 were found to already be reduced on laparoscopy/laparotomy. When these 6 cases are excluded (as they are not defined as failures) the CoRR is 14/16=87.5%. The CoRR is a more representative measure of intussusception reduction success rates than the SSR, accounting for patient pathology and outcome. Our centre achieved a CoRR of 87.5%.